If you want to pass on your skills it is possible to use this kit to help others pick up the rudiments of cross stitching. Children could work their own counters - changing the colours from those shown on the chart if necessary - or stitch a chosen snake, or help complete one of the green squares. The game board is worked on a sheet of white perforated paper, with room for the counters and dice above the board. The kit contains the paper and thick card to back the board, plus felt to finish it off. There is also thread, a thread card, a needle, thin card to back the dice, a chart and full instructions. 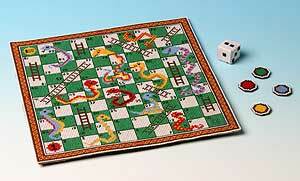 When complete, the board is about 22 cms square, and the instructions tell you how to play Snakes and Ladders if you don't want to make up your own rules!